Leaving Bali, we head east and onto eastern Crete, a part none of us had seen before. Having sat in Bali with lots of beautiful wind blowing through, the day we decided to leave not a drop of it to be found... We said our many goodbyes to both old friends & our other cruising family, and motored eastward to Elouda Bay, and Ay Nicolaus where we planned to stay the winter. Eastern Crete is stunning, a world of big scenery..... The mountains climb out of the sea, and you cannot be amazed by the beauty of the place. Elouda bay is situated just as you come round the headland and past Spinalonga Island, one of the last leper colonies in Europe. As we head past the island and into the bay, the depth climbed to just 4 meters below Maya, so 2 meters below her keel, and watching the bottom go past as you peer over the side can be quite unnerving. However, this soon dropped again & the bay itself is stunning for the the sheer tranquility of the place. Crete, and certainly eastern Crete are totally off the charter yacht circuit. Once the last tourist boat had left for the evening (which happened to be a day tripper, party boat! ), we had the place to ourselves. Just the lights of Ay Nikolaus in the distance. Swimming in these kinds of clam shallow waters are stunning & warm. Although we had planned to go visit Spinalonga, as we are wintering in Crete, 10 minutes away in Ay Nicolaus we decided due to the masses of tourists to give it a wide berth for now & see the island on our return. So following a quick stop in at Ay Nicolaus marina to sort out winter things for Maya, such as haul out dates, we head onto the most deserted part of Crete, the far east & last stop on the Island Vai. Vai is home to the palm beach where the bounty advert was filmed, and there really isn't much else there. We were the only yacht around for miles, and we enjoyed two beautiful days anchored off, with only the company of a hermit-esque old man living on the rocks with his dogs for company. And so on to Kasos & Karpenthos and eventually Rhodes....... Well actually we gave Kasos & Karpenthos a wide berth in the end. With the words of 'Rod Heikell', the gentlemen who has written many a sailing bible, including the ones on Greece & Turkey, ringing in my ears, speaking of 'angry seas' around these parts, it was a nervous & hasty departure. You see when the Meltami blows through the Aegean, it starts up at the top near Istanbul, and tends to go east or west. When it goes west it whistles down the eastern side of the Peloponnese, being channeled between the many island in the middle of the Aegean & the mainland & zips out past the most western part of Crete. But when the Meltami blows in the eastern side, again because the many island in the centre of the Aegean, the wind has 300 miles to pick up speed before it whistles through the gap of Crete & Kasos & between Kasos & Karpenthos, and again between Karpenthos & Rhodes. So with the beginning of a Meltami week/fortnight ahead, we pushed on and onto Rhodes, not wanting to get stuck with my parents arriving in Rhodes the following week. As it happened, even with no real Meltami blowing the gaps between the islands were like sitting in the cockpit with 20 hairdryers trained on you. This combined with a nasty cross sea, was enough to be thankful once in the lee of Rhodes. My only complaint was loosing what i can only imagine to be a massive fish, be it tuna or whatever, because we were unable to slow the boat down enough, in these conditions to pull in the lure..... The one that got away! My lure bore the teeth marks and that was that. So after a long night at the helm, having been blown dried to bits, we finally receive some well deserved respite as we finally pulled in behind Rhodes. As it happened by not stopping in Kasos as we had wanted to we were now early for Mum & Micks arrival; So we went to a small bay just south of Rhodes Town - Lindos for a couple of days at anchor. Its a cute kind of place despite the hordes of tourists, but unfortunately in the water at anchor you get hounded by the waterspouts guys pulling every shape & creation behind them at speed, much to our pitching annoyance. And on land the beaches are over crowded and generally a bit tacky. That aside, we had a few lovely days just chilling out. I say chilling out, i mean that in the lying horizontal or hanging in the water kind of way, because one things for sure, you will never really chill out sitting on mirror in 40 degrees. This is something we had been warned about but boy did we get to learn about it first hand. Living on a boat i the eastern Med in mid July, August, September is not for the faint hearted without aircon. So during the days we swam to keep cool & took Audrey & Bertie on the obligatory donkey ride up to the ruins on the hill, and then would swim some more. In the evenings Nicky & I would hang off the back of the boat for 20mins before bed time just to cool our blood sufficently to sleep. We have decided going forward, we will have to either invest in a generator & an air conditioning unit for the boat or not be sailing in these parts at this time of year. Our sanity only just prevailed. And so onto Rhodes, where we met up with Mum & Mick, and one of our other sailing family friends Pablo, Dini, Noah & Gael off SY Happy Dancer. We went into the new Rhodes marina which is an interesting place. A brand new massive marina all ready to rock & roll to bring in some juicy euro dollars for the cash strapped Greek government. Alas they forgot to put in 99% of the pontoons, doh! Nice try guys, try again next year. That aside the staff were lovely, and the ammenities such as water & electricity were running so all was fine down our end of the marina. We'd managed to get Mum & Mick booked into the Rhodes Sheraton which was right up their alley. They liked it, we liked it, everybody happy, job done. And we had a lovely week catching up. Now it has to be said going from Maya where you might just be able to swing a cat if you're lucky, to spending a few nights at the Sheraton, could be classed as an up grade for us simple sailing folk. But it was certainly a treat away from boat life that for sure. Choosing between which one of the 3 pools, or which one of the 3 pool bars involved some pretty tricky decision making, and Audrey & Bertie loved being by a hotel pool, much to my scorn. We did some of the obligatory sight seeing, of which there is plenty on Rhodes. But the heat being what it was made and excursion with kids especially exhausting. So we mostly enjoyed catching up with Mum & Mick whilst listening to the Aussies getting wooped in the Ashes, & drinking cold beer under the air con. Its the simple pleasures after all. It was also so nice to see our sailing friends again. We'd last seen them in Malta, and they'd already been to Turkey, and were now on their way back via Crete, before heading off to the Carrebean for the winter. They had really enjoyed Turkey, despite having done a lot of work on the boat. And it was so nice to be in the company of another cruising family again. As we bid them farewell, & fair winds we also decided to make our final last big passage of the season and onto Turkey. Having not been in Bali, Crete for over 11 years since Nicky & I met there, i think we were both wondering what had changed, and what our old friends were up too, and if they would still remember us. Well on the whole i think almost everybody recognised Nicky, and nobody recognised me. Some even needed reminding what i'd looked like 11 years ago... But it was great to see everyone, my old boss & captain of the Bali Catamaran Lefteris & his wife Maria, were a little stunned i think, but he soon pulled out the stops to find us a place on the inner harbour wall, moving small fishing boats to make room for us, and making sure we had some electricity & water, all free of charge. Amazing! His brother Yannis & Georgia, who run the 'Starbar' were as helpful & inviting as we'd both remembered, always helpful to our small requests, and Yannis always happy to get me drunk on beer & raki. Nicky's old boss from the dive centre Angelo had heard we were back in town & came by the boat, and when he saw we weren't there left a bag with watermelon, honey & home made raki, and shells for Audrey & Bertie. Very sweet indeed! 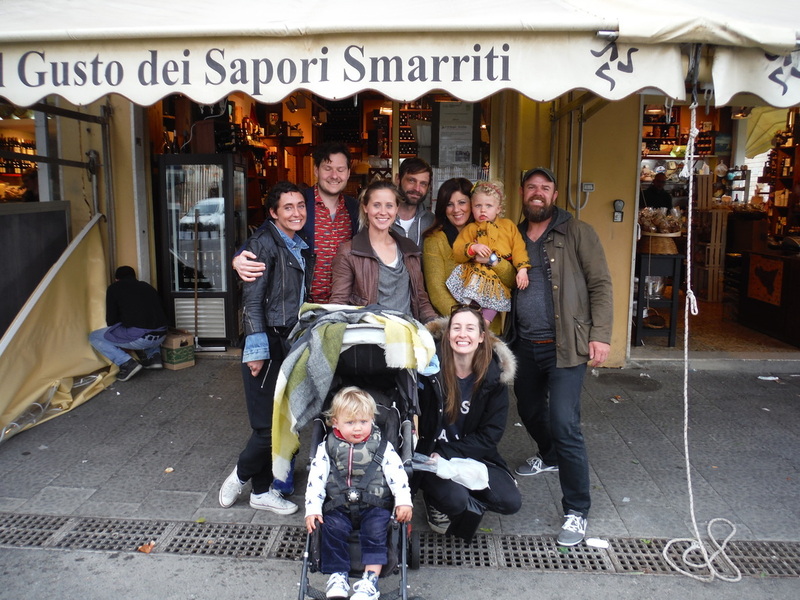 And also Jim & Els, were still there, and Uncle Vasilis made his annual pilgrimage..... so great to see them all. After a day or two we knew we'd made the right move by coming to Bali, our old friends were happy see us, and we them, but more importantly Audrey & Bertie were happy to have time to be in one place and go to the same beach every day. We would start our days by watching the giant turtle who we named George, and had made Bali his home swim into the port, followed by breakfast & swims off the boat to the beach. Going for pedalo rides or chugging through the village on the small train which there now was. Some things had changed, and Bali had grown a little, but on the whole most things were pretty much the same as when we'd left. A few days after we arrived our cruising family friends which we'd first met in Paxos, arrived one morning, totally to our surprise, Dominik, Natalia, Jonathan & Latizja on SY Manolito. What a lovely lovely surprise! Although their children are a little bit older than Audrey & Bertie, they loved to see Audrey & Bertie & visa versa, and were always happy to play with them both. For Nicky & I, i think seeing cruising children who were a little bit older was also very interesting. A totally dynamic to cruising, than with two small ones, like Audrey & Bertie are. For us too having new friends as company again was nice, as late night drinks in the cockpit with friends is one of cruising simple pleasures. After a week of having been in Bali, Nicky & Audrey had return back to the UK for Audrey to be seen by the doctors at the Evalina children hospital, which gave Bertie and I some boy time to hit the beaches, go jet skiing, and generally get down and do some father son bonding. We did miss the girls a bit. Needless to say our diet was terrible, but we made up it in other ways. On the girls return we had talked about heading off at the end of the week to see a little more of amazing Crete, but with London having been so stressful we decided to stay the week, and do very little and relax & enjoy. With our friends also finding Bali so easy and conducive, the days rolled by in a care free manner. And so one week turned into two and before we knew it we'd been there a month. To be honest we have very little to report about Crete itself, we watched avidly as the Greek tragedy unfolded, with the referendum coming & going. Which was interlaced on our part by fleeting runs to cash point to make sure we could still get cash out. But with Audrey & Bertie so happy to just play & be kids on a beach, time just slipped by. With my parents having now made a firm date to meet us in Rhodes in a few weeks time, we slowly started break camp once more & say our goodbyes, to meander our way east. We love Bali & our friends new & old there, we miss you all. The Pelo po knees, and onto Crete! From the amazing setting of Zakinthos we head across to the Peloponnises, to the port of Katakolon from which we could visit ancient Olympia. Katakolon itself is a bit of a dive, with the main business being the large cruise liners which come in unloading the masses to go visit Olympia, or the nearest pub on land in most cases. We hired a car and made the pilgrimage to the site of the original Olympics. This place is truly stunning, the serenity & the 2500 year old history draw you in, and with plenty of shade from Olive & other trees, we happily wondered around, often sitting under a tree taking in the atmosphere. The sheer magnitude & preservation of the ruins is spectacular, and totally worth the visit. On the drive there and back we were stunned my the mountains of rubbish piled up at the sides of the roads. Every slip road or rest stop, off the main highway was piled high. Up till now we had not really seen the impact of the financial crisis Greece currently finds itself in, but this was a very clear manifestation of the difficulties this beautiful country finds itself in. We stayed in Katakolon another night at anchor and then had a beautiful half day sail down to the small post town of Kiparissi. With not much on offer here, except a small town & a hightening Greek financial crisis, we withdrew some additional Euros, and moved onto the beautiful town on Pylos. Set in the beautiful bay of Navarino the town and bay have a great naval history as the sight of a battle between the Turkish/Egyptian navy & the British. Apparently there a few hundred wooden boat lying in pieces as the bottom of the bay. The town has a very French feel about it, as it had also been under their control for a number of years. We took the opportunity to be moored up, side too, against a large harbour wall to get the tender out and poodle across the bay for a day at the beach. Luckily i decided to take an extra jerry can of fuel, as by the time we'd arrived on the other side of the bay the outboard was running on fumes. Having been worried about not having checked the anodes on the bottom of the boat for a while i also took the opportunity to get the dive gear out and take a closer look. My worries were well founded. The anode around the prop shaft was missing, the ones on the rudder were loose, and the others very much almost worn through. Luckily Pylos has a decent enough dive shop which was able to order in all the necessary anodes, and after half a day in the water i was able to change them all with no problems what so ever. The dive gear is already paying for itself, and my confidence using it is also growing. Having been on the road again for nearly 2 moths again, Nicky & I now decided it was time to find a place to stop and give Audrey & Bertie some time to feel settled, where we could relax near a beach & cosy restaurants & bars. Our initial thought was to push on and head straight for the Aegean Islands and onto Turkey, where our cruising friends Dini & Pablo on SY Happy Dancer were headed with their children, but the prospect of doing all these miles east, feeling slightly rushed, just didn't add up in our minds. With our Raymarine wind instruments having also decided to stop work again, the prospect of going though the Meltemi belt without them was another concern. So we decided to hold off making a decision and head onto the eastern corner of the Peloponnese of Elefonisis which is famed for its crystal clear waters and make a decision there weather to head east to Santorini & Turkey beyond or perhaps head south to Crete, where Nicky & I first met. We had a fantastic sail down with the wind blowing hard from behind, we made great time covering 80nm in just over 11 hours. A long days sailing but very exhilarating! We found a lovely little anchorage with a dozen boats all tucked up away from the wind for the night.... With a good nights sleep behind us we made the decision that we would Neopolis that day, stock up on some supplies & head for Crete the following night. Having arrived at our first summer sailing area we are blown away by the beauty of the Ionian... From Corfu Town we first went north up to a the small beach of Kalami to savour our first swims, beach & greek meal since arriving. And it couldn't have been better, with the tender glue still drying, we anchored Maya just off the beach and swam with the Audrey & Bertie on the lilo to the shore. The simple pleasure of letting them run up and down the beach whilst enjoying a chilled karaf of Rose, followed by all the greek culinary delights was fab. So we stayed another day before reports of bad weather coming down across Albania made us seek some more shelter in a more protected bay just north, but equally charming, Ay Stefanou. Part of our reasoning for coming this way was so that we could meet up with an ex colleague of Nicky's, Chris, with whom we had a very long standing arrangement to come visit, when we finally came sailing past this way. And it was so great to see him. Chris is an amazingly talented architect, and has spent the last four years developing an old ruin into the most amazing house, perched high up over looking the Ionian we were welcomed by him & his friends Bob & Lesley to a proper greek BBQ and great greek wine. Thanks again Chris! From here we sailed back to Corfu town to take in a little culture and see if we could meet up with an old sailing buddy of mine Robert who's boat we knew was moored up at the Corfu sailing club. Unfortuntely, he wasn't around so we took in some of the sights, and provisioned for our sail south through the islands. I also needed to revisit our battery charging issue, which involved changing fan belts on the alternators & tightening them up. Corfu Town is lovely, if a little touristy, but its charm was still worth a visit. Audrey & Bertie also enjoyed keeping the shop keepers on their toes & playing in the park over looking the old fort. Leaving Corfu Town we had a beautiful sail down to a bay just north of Igoumenitsa, called Ormiskos Valtou, where we were one of only 3 boats anchored for the night. As we are now getting used to, evening swims were combined by a BBQ on the back of the Maya, before relaxing and watching the sun go down in the west. The following day we took the tender out as Bertie has now become obsessed with the little boat. So visiting the mud bank where the wild birds were nesting, was combined with giving Bertie his first lesson in driving the tender, which he just loves. Setting off around lunch time we again had great wind to sail across to a small bay on the north coast of Paxos, called Lakka. Now because Lakka is the first of only a few anchorages on Paxos it tends to get busy and by the time we sailed in there were somewhere in the region on 15 boats all anchored in a pretty tight formation. But finding a good spot next to a beautiful wooden boat called Diana, which belonged to a lovely family from Hamburg, we settled in for the afternoon. Little did we know that another 10 to 12 more yachts would try and squeeze there way in, mostly charter boats, and boy is it interesting watching these guys trying to navigate a busy anchorage. Watching the calamity of some of these guys trying to anchor has since become part of our afternoons entertainment. With anchors dragging & other yacht owners cries of protestation, an ice cold beer can ofter been enjoyed watching this spectacle. Lakka itself is lovely, very much geared up for the yachts which come to anchor in their bay there are many very cute restaurants & bars, and the ability to provision, if somewhat on the expensive side. Although we had read reports of rats in the bay swimming out to boats, i was pretty confident that this was more rumour than fact. Unfortunately, when we visited the small park near the centre of the town, Nicky saw a rat scampering through the play ground, and we beat a hasty retreat in search of a slightly more child friendly environment. And so onto Mongonisi on the south of the island. Here we were joined by another lovely cruising family from Germany (Dominic, Natalija, Jonathan & Latiza), with whom we would sail through much on the Ionian, finding them at anchorages or visa versa. From Paxos we then had a longish sail down to the Lefkas canal, with the day starting off rainy with no wind, and ending up with 30knts just as we came to the tricky bit at the entrance to the canal. The canal in only opened every hour on the hour for a limited amount of time, so getting there on time is paramount. As we got to the entrance there were several boats jostling in the wind, waiting for the horn to signal so we could make our way through. As it happened we were at the front of the stack as the horn went off and with a little trepidation were the first boat in. The canal is cut through the salt flats and lets boats of a limited draft through to what is called the inner sea, to the islands below. At the advise of our German friends we head past Scorpio and on to a beautiful bay on the north side of Meganissi. Here we spent a few lovely days in the beautiful bay of Spillie Beach, swimming, go on bike rides and even getting the new diving gear out to have a look at the underside of the boat. With the wedding over it was time to say good bye to some friends before the wedding parties flotilla around the islands began. Not wanting to head straight north to where the flotilla began, we found a little bay just next to Fiskardo, and spent the next two days at anchor with south dock friends Kate, Adrien, Shebby, Lee & Julie all coming to hang out and chill on Maya. BBQs, walks in the hills, visiting caves & mucking around in the tender, were all a plenty. I think we may have a few causing converts! With a few restful days behinds us at anchor we head across to the small island of Kastos to meet up with the wedding flotilla. As it happened we ended up just meeting up with the largest boat a 40 catamaran skippered by our friend Alex & his crew Shang, Gloria & Jade, and their friends Jon & Max..... The next week was amazing, beach BBQs, star filled skies, blue lagoons, stunning caves & ship wreaked beaches. The ship wreaked beach in question is on the west coast of Zakinthos, and is totally stunning. I first saw a photograph of this beach 10 years ago when i was in Crete, and there was no ship wreck there. Arriving at dawn you have the beach to your self for a few hours. Alas by 11 o'clock, we took refuge on a tiny pristine beach just off this beach as the 100s of tourists arrived in an armada of boats... Being able to anchor in this bay again alone in the evening was again stunning. We took sun downers to the beach & enjoyed the most stunning of sunsets. The next day Alex & his crew had to return north to send people off to the airport and we made our way south/east and onto Kallithea on the Peloponnese from where we could visit Ancient Olympia. So no longer able to stand beautiful but way to rolly, Rolly bay in Valetta we set sail Wednesday morning, early doors, on what was supposed to be a straight, as the crow flies romp across the Ionian... Needless to say the best laid plans of mice & men, one mile out of Valetta, we noticed that our batteries were not being charged quite as they should be. Now on board we have a clever little devise which tells us what voltage is being produced by the alternators when the engine is running, and this also tells us our SOC (state of charge) & TTG (time to go), now although our voltage was reading a healthy 13.5 volts, our SOC & TTG were both dropping... With this on our minds we decided in the interest of prudence a quick over night stop on the south eastern tip of Sicily would be best, as the best of the westerlies didn't kick in till Thursday anyhow. So we had a very ambient 60 mile sail up to Sicily with a european Turtle dove hitching a ride, until we got to Porto Paolo on SE corner of Sicily before the wind pick up to 30knts, and we didn't fancy the unattractive anchorage on that corner. Our plan B was to round the corner & and go into Marzamemi marina until we got round the corner, and now having 40kts on the nose which looked even worse for coming into a marina as night started to fall. So we did the right thing and ran away..... We turned 180 and did a blissful 6knts down wind direction Siracusa. With Audrey & Bertie in bed, time for a council of war. Should we go for Siracusa & anchor in the bay or keep going and assume the decent amount of voltage we were getting from the alternators, along with our solar & wind would be enough to keep our batteries topped up till we got to Greece to investigate further. So we went with the keep going option & head across to the toe of Italy... And boy did that seem to take a long time. Now to my knowledge there are only two places in the med with tides of any strength worth mentioning. Gibraltar & the straights of Messina, and it did feel like we were punching a lot of tide. By the morning we were still not quite across. Luckily the westerly we'd been hoping to ride all the way to Greece appeared in force the next morning and under full jib & 3/4 main we stared to chew up some miles up the foot of Italy. As the wind speed increased & we decided to pull in a little more jib, when the stopper knot which enables us to furl the jib from the cockpit slipped & we now had no way to pull it in..... b*****ks!!! It reminded me of racing days of old, having to drop a no.1 head sail in a hoolie is sweaty business! Thank god we'd had our bacon & egg sarnies for breakfast. With Audrey & Bertie strapped into their front row seats in the cockpit, mummy & papa went to work..... It must of been quite entertaining for the two munchkins watching us frantically trying to stop sail & sheets going over the side & lashing the whole lot down on the for deck, for us to then 5 minutes later perform the whole ritual again in reverse.... With this ordeal over we made good progress throughout the day till, that evening we finally decided to gun it across to Greece. Cracking off the sails we soon had the evening breeze of 35-40knts, and boy does our little boat love 30-40kts. With just the head sail half out we were bombing along through the night. It's truly one of the amazing feelings when you get out of the shipping lanes which traverse up and down the coasts, and get out into real wilderness of open water. Away from all the lights which emit from the coast and into the thick of darkness with the stars above you shining so brightly. To come from a city of 12 million people to being 100 miles from anyone is quite an eerie & yet totally liberating experience, and also somewhat humbling all in one. When we bought Maya we bought her on her reputation of past performance and this trip more than before brought it home to me what a great boat she is. As the winds pick up, she just performed better & better. By the next morning we were almost half way across, and already discussing our Greek dinner..... Tatziki, Hummus, Vine leaves, Calamaries, Halloumi...... When the ciggies run our mid passage, talk of food will keep you going! So another day & bumpy night avoiding the big boats on the Greek coast line, and we sailed in between the southern tip of Corfu & northern tip Paxos, as the sun rose over the misty horizon, totally stunning! Just a lovely 4hr down wind sail, up the island and into Gouvia marina for a very well deserved sleep! Having replenished on sleep, fixed the gash in Tiddler the tender with stitches & patches, changed the fan belts on the alternates & the split battery diode, & turned Maya into a chineses laundry eyesore of the Marina. We are back at anchor just outside the Gouvia marina, at a lovely anchorage. 30 degrees, the sun is shining, first swims had - let the summer begin in earnest! So we finally slipped out of Marina di Ragusa at 7 in the morning due south and happy to be on the road again. A beautiful morning and a few last good byes and we were on our way to Valetta! With a light easterly to blow us the 50 miles across to Malta we had a beautiful sail down, crossing the shipping lanes with no bother & arrived into Valetta late afternoon and found our mooring in Msida creek Marina next to our new found cruising family friends on the good ship Happy Dancer - Pablo, Dini, Nona & Gael. Sailing into Valetta is an experience not to be missed, the cities history is undoubtedly based around the sea and the comings and goings of many great cultures over the centuries. The following week was spent letting Audrey & Bertie have time to play with their new found friends, Noah & Gael, seeing the sights of Valetta, and making good use of the excellent chandlery facilities to be found in the city. As our friends had to return to work in Valetta, we decided to take a cruise around Gozo for a few days, before deciding our next move. The coast off Gozo is stunning and a sailing delight. The stunning sheer cliffs & second cleanest waters in Europe after Cyprus, making for some sublime sailing & anchoring. I'd never been to a place where you can watch the anchor drop down seven metres, and see it bottom the way you can here, very rare indeed! For our final sail down to Valetta again we were blessed with a beautiful westerly breeze on which to sail all the way back down. With Marina fees jumping from €25 a night to €50 a night in May, we decided to ancor in St.Juliens bay with is just north of Grand Harbour & Msida creek. We have now re christened it Rolly Bay for obvious reasons. That aside, the parks, beach & general facilities on offer here are excellent. And a short tender ride, and we have bars & restaurants on our door step. Audrey also had a touch of conjunctivitis, which we managed to get seen too by a local doctor & drops from the chemist. She's very much on the mend now. After a few days of rolling around in Rolly Bay we decided we needed a little break so head back down to a small anchorage just inside Grand Harbour to do a little more adventuring with the tender. Dockyard creek is fabulous, on the left you have Billionares row of mega yachts & on the right an array of stunning Venitian style gondolas made of wood & varnished to the max. We visited here on Maltese Mother's Day and all the families were out in force, sitting at the restaurants which line the dock side. In the late afternoon we made our way across to Valetta to have a fair well drink with the crew of Happy Dancer, alas as we came along side the quay a wave washed us against the wall and large metal spike which sliced a 3 inch gash into our little rubber ducky, disaster! I left Nicky & the Audrey & Bertie to meet our friends, while a speedily turned the boat around and head back to Maya in the tender with only the port side inner tube of the Tinker keeping me & the valuable outboard engine from going under. Luckily I just made it, as the outer tube was now taking in a lot of water. Nicky was able to call one of the beautiful Venitian style gondolas, which works as a water taxi, to give her & the two munchkins a ride back to Maya. My envy on their arrival must have been noticeable! So we've had a beautiful stay in magical Malta, perhaps we shall come back next year on our way back out of the Med, but for now we are looking to leave on Wednesday, as a fair wild blows from the west, and takes on to Greece. So we've been in Sicily three months now and we felt it was time for a bit of an update. Marina di Ragusa and indeed Sicily is a wonderful place and we have been overwhelmed by both the friendliness of the locals as well as our winter live aboard community in the marina. Marina di Ragusa itself is a lovely, lovely place. From the marina you walk along a sea front promenade by the beach to the main square where you find cafes & bars & restaurants dotted about. With coffee & ice cream to die for, 'Cafe di Rosa' being our favourite. In fact the coffee in Italy across the board has been amazing, with a fixed price of 90 cents for a maciarto, you can't help but develop a coffee habit. The prices for food and drink are increadble, and the quality is simply out of this world compared to the super markets in the UK. There is a small market on a Tuesday morning we always go to, and for under 40 euros we have a plentiful weekly supply of fresh fish be it Sardines, Calamaries, Dorate or Octopus for the BBQ and so much fresh fruit & veg, which just tastes amazing. What we don't get at the market we get at the local Spar which has a everything else including good cheap local wine & beer. The Sicilians themselves are some of the nicest people we have so far come across on our travels. Everybody greets you in the street with a Bonjourno or Ciao, and with Audrey & Bertie all we hear is countless Bellissimos & Bella blonidia. They are so friendly & can simply not do enough for you, it really is quite staggering compared to the hustle and bustle and busy lives we lead in London. So what have we been up to? Well up for the first 4-6 weeks we were splitting our days between being on the beach, visiting the areas around Marina di Ragusa & doing small jobs on the boat. Our first priority was to get some transport & Rolf managed to find some abandoned bikes in the marina which needed doing up & getting some kids seats on the back. This has meant we are able to get around Marina di Ragusa with ease as well as head up and down the coast on bike trips. Audrey & Bertie have loved playing on the beach, but now the weather & sea are a little cooler Audrey has started nursery here, in a small nursery in the town which she seems to love, three mornings a week. Although we do still often toddle along the beach with the kids in all weather suits, climbing rocks, finding treasures and playing. We've visited Ragusa which is set in land 20mins away by bus, with the old town being a stunning old Baroque style. We have also been to Catania & Siracusa which are both stunning, Siracusa in particular. The morning market in Catania in something else, with the most incredible variety of fresh fish, meat, cheese, fruit & veg on offer. And Siracusa is an amazing city, which we can't wait to go back and visit again. The winding back streets are made to get lost in, and we would really like to go back there again and stay for a few days. Perhaps early spring when the weather is nice we will sail down and anchor off. We are all loving the outdoor simple lifestyle here. And have enjoyed also having people come to visit. We've find ourselves out and about allot going on long walks to places like Punta Secca Lighthouse, or along the beaches. Family time is more plentiful and it feels nice to slowly be relaxing into the cruising lifestyle and slowing the pace down, but keeping the excitement high! We have found that we have managed to find a rhythm around when Audrey goes to nursery & the days we need to get food & do jobs on the boat. And with the weather having been so warm up until a week ago, just being out doors has been a real joy compared to in London at this time of year. Audrey unfortunately had a bad fall back in October/November splitting her top lip quite badly. A trip to A&E and 3 stitches later, with no pain killers, she was really brave. The stitches are all out now and the scar is healing really well. Again we were amazed at the genuine kindness, where in our initial panic, a local bar manager drove us all the way to the hospital, stayed with us for the 2 hour wait, and even had Bertie sleeping on his shoulder. Our first emergency A&E trip as parents, hopefully not to be repeated often. On Saturday we are off on a road trip up the east coast of the Island to visit Acireale, Riposto & Taormina, and go up Etna for some sledging in the snow or see the volcano spouting lava as it has just had an eruption we were told. Having returned to Sardinia after our wonderful time on the mainland, we were pleased to find Maya safe and sound and we were refreshed and ready to finally start taking the pace a little slower & start enjoying our time finding little anchorages to hang out in & relax.... Having stocked up on fruit, veg, fish, diesel & water, we head off just north of Algehro to a small anchorage known to us both from when we had last sailed to Sardinia with our good friend Robert. And it was just as we had hoped for, a tiny bay with us being the only boat there, peach! We spent the next two days, swimming, relaxing & in between hitch hiking with the kids to the local 'Neptune's grotto' to see the amazing stalagmites & tights.... Good thumbing Nicky! We'd been told by a German couple Bernd & Hedi in Alghero, of a lovely little village only 30 miles south, where we could anchor and enjoy the beautiful beaches for a few days so we decided to head off the next morning only to find the windlass didn't work! That's an anchor puller upper to you none lays! Luckily we'd only been anchored in 7 mtrs for the past few days so the job of pulling up the anchor by hand was not too back breaking.... So off to Bosa, slightly upset that we might have to go into another marina with the windlass not working, we went. As we gently made our way down the coast I set to working trying to figure out if the windlass had gone, the diode had gone or if the switch had gone. Having short circuited the windlass and got it wizzing around above my head I found the deck switch had totally corroded. Bring out the Coca Cola! For those not in the know, Coke not only tastes great, rots your insides but it also cleans up corrosion on metal in a jiffy. After 10 minutes of scrubbing with a tooth brush the switch was clean & working as good as new. Time to hit the beach!!! As we head out of Bosa town quay marina & into a beautiful bay around the corner, we were again the only yacht around. Audrey & Bertie just love being on the beach & the excitement of getting in the tender & zooming ashore always makes them smile.... Having read in one of our yachting books that it's good to get the kids involved & rowing ashore can be one of these activities we rowed ashore. One dicky oar & a slightly deflated starboard side tube was nothing to worry about! We'll not until the afternoon wind picks up anyway! As we were almost ready to leave, the beach turned into a scene from Lawrence of Arabia and I suddenly realised we might seriously struggle to get back to the boat.... Leaving Nicky & the kids on the beach I frantically rowed for all I was worth against the onslaught of wind, and as I reached Maya I dropped an oar in the water. As I leant over the side to save the oar I fell out of the tender, much too Nickys fright on the beach. I was now faced with the tender rapidly going one way, the oar & Maya going in different directions. Luckily I was able to swim to the tender & rescue it, the oar & myself by swimming in the lee of the yacht. Pretty? Pretty ugly! and not to mind feeling a wee bit silly for leaving home without the outboard motor! Lesson learned. Our next stop was to be one of culture & nature goodness. The ancient city of Tharros is situated pretty much half with down the west coast of Sardinia & was founded by the Phonecians in approximately 1900BC. As you pull round the headland you are treated to the sight of the cities ruins, with its columns still in tacked, and a beautiful anchorage right beside the city to spend a few nights. We enjoyed walking to the look out tower which over looked the whole head land, and the ancient ruins below. We left Carlo Forte & St.Pietro starting to feel what it's like to be living in Italy, and pretty happy with that! The next leg of our journey would take us around the south west coast and up in to the capital of Sardinia, Cagliari, to pick up spares, refuel & look for a weather window for our crossing to Sicily. This south western tip of Sardinia is stunning with beautiful islands just off the coast, and we finally had some company of yachts again which made for some interesting afternoon racing! We decided on a final anchorage before we hit the big city again, and found the most beautiful bay of Malfatano on the south coast which had a perfect anchorage to the west and beach & anchorage to the east. As we arrived in late and there were already quite a number of boats in the western bay we took our place on the outer side of this bay, which to be fair I'm always happy with. As long as you have enough shelter, the side with the most water to run too is my preferred choice. We put the hook down and enjoyed an evenings swim around the boat before supper on the BBQ. At 7am we were woken by the kids. By 7.30 we were all sitting up on deck as the most deadly rumble of thunder rolled over head followed by huge cracks of lightning. By 7.32 we were in total white out being hammered by a 70knt blast. I was just quick enough to jump on the fore deck and tie the tender on before it got blew away. Maya was healed over at 30 degrees and we were being hammered by a blizzard with hailstones the size of large marbles. With Nicky & kids down below all I could do was sit behind the dodger and watch on the chart plotter as we were slowly dragged out to sea. I started the engine just in case we needed to move some, but my greatest fear lay in a yachts above us to the wind, loosing or dragging on their anchor more rapidly than us on ours, and come flying towards us. After 25-30 minutes of the strongest winds I have ever seen or felt had abaited, we were 200-300 mtrs from our original anchorage spot in 20mtrs of water, which had been 7mtrs. Thank goodness for plenty of chain & a big enough anchor & for being pushed out to sea. We had been lucky to be on the outside. A catamaran inside us had dragged so badly that it had taken a large monohull with it and they had both almost ended on the rocks behind by metres. On the other side of the bay one poor unfortunate had been blown squarely on the beach & lay stranded, pending coast guard rescue. Lessons here a plenty, but anchor, chain & katabatic winds..... Beware! To go, or not to go.... That is the question?